Manufacturer’s guide gives detailed instructions on how to take care of batteries. This is one of the first steps one should follow to ensure that batteries function efficiently and last longer. 2) Check the batteries for any defects. This can be done by examining carefully whether the batteries are leaking or have developed any cracks. It is also necessary to ensure that no dust gathers on the surface of the batteries. The adjoining parts of the batteries should always be dry, clean and free from rust. If some of these defects are detected in the initial stages itself, it is simpler to rectify them quickly and easily. It is important to remember that one should use only distilled water for cleaning the batteries in order to ensure personal safety. Lead-acid batteries are hazardous and therefore, it is important to be extra cautious when cleaning the batteries. One should put on protective clothing and wear goggles and gloves for proper protection while cleaning golf cart batteries. A mixture of baking soda and water is very useful for cleaning the surface of the battery. For this purpose, one can use either a cloth or a brush and while cleaning it should be ensured that no fluid gets inside the battery. It is very important to make sure that battery terminals are clean without accumulation of any dirt and they should always be kept dry. Battery watering guns are useful for filling the golf cart batteries with water. While filling batteries, it should be ensured that water is filled to the correct level so that they function efficiently and last longer. A proper cleaning of batteries from time to time prevents formation of rust. As a good maintenance measure, it is advisable to clean the surface of the batteries with baking soda solution every month. This will ensure that batteries last long. One should also clean the battery at the slightest indication of deposits of rust on the surface of the battery. The accumulation of rust on the surface of the battery is mainly responsible for the fast discharge of batteries. It is also necessary to confirm that there are no loose connections before charging. It is a good practice to charge the batteries daily after use, as a matter of routine. This will increase the life of the batteries. The durability of the batteries will also increase if they are stored properly. 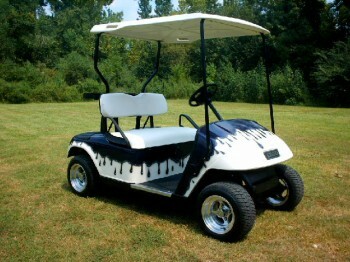 When the ‘golf buggy’ or golf cart batteries are not likely to be utilized for a long time, they should be completely charged and kept in a cool and dry place. It is also essential to disconnect the batteries from the charger. 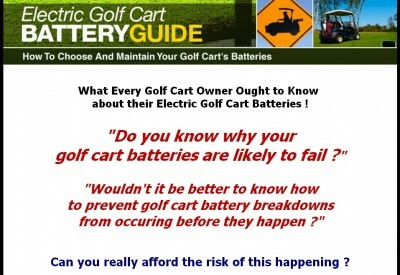 If the batteries are to be stored for a long time, they should be taken out from the golf cart.